Combine a sport that requires you to shift your body weight atop a board and a peripheral that requires you to do the same and you've got a match made in heaven, right? 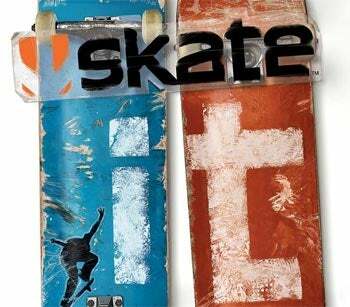 That's what EA is hoping for with Skate It, the Nintendo Wii iteration of their Skate series of skateboarding games. Taking the gameplay of the original and adding support for the Nintendo Wii Balance Board controller, EA had the chance to create the most realistic skateboarding experience to ever come to a home gaming console. Let's ask the assembled video game critics of the world how that all turned out. 1UP (Pre-Revision) The slightest twitch or turn of the Wii-mote creates a wholly new effect — and frequently, it's one you don't even want. It's even worse on the Wii Balance Board; by default, the turning is overly responsive, even after reducing the board's sensitivity. However, this makes it harder for the device to register a trick. It worked better when I stepped off the board and then tapped a specific area to pull off the desired move. This isn't skateboarding — it's crappy aerobics. 1UP (Post-Revision) The Balance Board is no longer oversensitive (although it's still hard to turn), and executing tricks no longer requires lifting a foot off the board and tapping a specific section — it does an adequate job of sensing when you touch an area with your heel or toe. It takes awhile to get the hang of, but it's certainly possible to play the game this way. Additionally the Wii Remote responds accurately to repeated motions 80 percent of the time. It's still not perfect, but it gets the job done to a much better degree than what we originally experienced. NZGamer Although the game flows with a beautiful filmic quality and some great features like slow-mo wipe-outs (complete with eye-watering crunches) and the Thrasher “Hall of Meat” which catalogues your injuries (broken pelvis? Get up you girl), the graphics really let the game down. While your character’s shadow is pretty slick, we’re talking distance shimmer and floating tree foliage. There are 2D sprites making up the backgrounds and times, and the whole thing, while looking almost-good-enough just comes off as amateurishly designed. PlayStation 2 at best – and I know the Wii’s not known as an eye-candy powerhouse… but come on. This is scrappy. Game Informer Skate It’s ease of use comes at a cost. The developer has (wisely) papered over some of the vagaries of interpreting player motions by sometimes giving you tricks you had not intended. At least the game’s challenges don’t often ask to perform specific moves. Still, I miss the satisfaction in the original Skate of mapping out a series of tricks in your mind as you approach a curb and then executing them perfectly. Furthermore, the game requires you to pull tricks earlier than you’d think due to slight lag. This makes judging rails trickier and your combo strings shorter. IGN Skate It comes highly recommended. The original Skate rejuvenated skating games with a new control scheme and a real sense of freedom, and that success carries over to the Wii. If you already played the 360 or PS3 version you won't find much new here, but it's great to have it on Nintendo's platform. This is a big package, including a long story mode, a huge variety of challenges, multiplayer games, a great soundtrack, and balance board support. It's too bad the balance board controls aren't friendlier, but I'm perfectly happy just using the remote and nunchuk. Aside from the sleek menus it's not much to look at, but the gameplay is engaging enough to overlook the visuals. Scanning your environment, plotting a long line of tricks, then figuring out how to pull it all off is very rewarding. Buy it. Kotaku To say I was deeply disappointed by this game would be an understatement. But, I'll be the first to admit that I had unreasonably high expectations both for what Skate It would do with the board, and (I'm starting to think) what the board itself is capable of delivering. Perhaps four digital scales coated in plastic just aren't meant to be able to measure precise shifts in weight. Maybe the balance board is something better suited to the sorts of games that it shipped with, titles that only need binary responses. Left, right. On, off. Forward, backward. It's probably too early to tell, but maybe after I check out the Shaun White sitting on my coffee table I'll know. Did they ship two different versions of the game or something?